I'm sitting in our camp's kitchen, which consists of two large carport tent structures we put up yesterday. It's one of five or six structures we're putting up in our camp. A couple of the domes are also up. 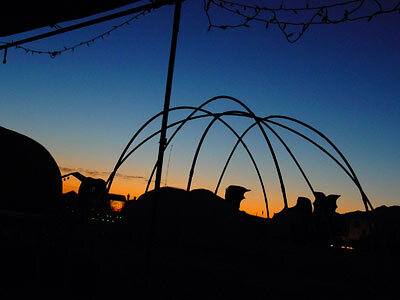 It's first light, the dark blue sky is boiling orange on the horizon, over the tops of tents and domes and sculptures and the mountains in the distance. The wind kicked up last night after dark, and it's still pretty windy. Most activity dies down when the winds gets too high, because the dust is just too much to deal with. It hasn't actually been cold at all either night so far; it's actually been warm enough for me to walk around in shorts. A small group who've been up all night called me over to the Omega burning sculpture in the middle of our village, offering me a wiener they were roasting in the remnants of the fire. Early breakfast for me. 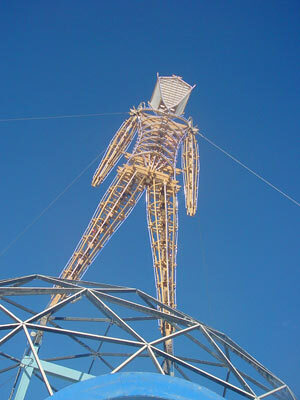 The Omega is a large metal sculpture that has extremely hot fires burning in both ends, which you can walk through. If you walk through really slowly, it's kind of like taking a very, very hot bath. Very refreshing. The sun's getting higher in the sky and there are people beginning to rise. Mostly the HeeBeeGeeBees, the healers in our village who have a huge tent full of massage therapists going in shifts all day long. Our camp's pretty much late risers, I learned yesterday. If I'm up before most everyone else, this is definitely a late-rising crew. But we got the structures moving along well by the heat of the afternoon, and hopefully today we'll get the rest mostly done. There's still a shower and a couple domes to finish. Update: It's Thursday, the wireless was very spotty for a while and then blacked out by sandstorms. But today's beautiful, Velma and I are sitting near Center Camp, sending a few postcards via the Black Rock City Post Office.